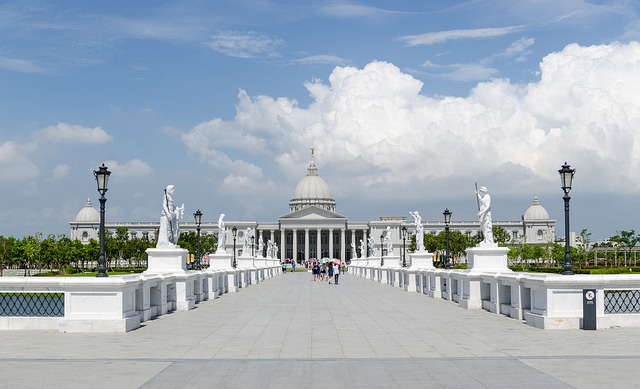 While many people hop on the train or High Speed Rail (HSR) to travel between Kaoshiung and Tainan there are some real gems that can be visited if you opt to travel by car. The HSR takes just 12 minutes, however it’s a good 30 minutes by cab or local train to get to downtown Tainan from the out-of-town HSR station. So in terms of public transport the best option is the regular train, which at least delivers you from and to the centre of the cities. The local trains take just over an hour and express trains around 40 minutes (Puyama trains take under 30 minutes, but you must have a seat and these are often sold out in advance). There are several advantages to simply doing the journey by car. Firstly, the travel time difference is negligible: by car you’re looking at around an hour. Secondly, the sights in Tainan itself are quite spread out, so you’re most likely going to spend all your time in cabs once you are there anyway. Thirdly, there are some great spots on the journey up that will give you a peek into another side of Taiwan. Finally, it’s simply easier to pop your luggage in the boot and not think about it again until you are at your accommodation. Just north of Kaohsiung city is the Fo Guang Shung Monastery. In a country which is littered with temples and shrines this complex stands out for its modernity. It is also home to a relic of what is said to be Buddha’s tooth, which was given to the temple for safe keeping in 1998. Accordingly the Buddha Memorial Centre was built to house it and the dramatic approach to the centre is flanked by 8 pagodas leading up to the imposing 50m-high seated bronze Buddha (said to be the tallest in the world as the base brings it to 108m). The whole complex is spread out over five small hills and it is the largest Buddhist complex in Taiwan. This is a great place to wander and take stunning photos - perhaps with some of the 14,800 statues of the Sakyamuni Buddha which surround the main shrine. This privately-owned museum opened its doors in 1992 before moving to its current location at Wenhua road. The new location is a favourite spot for taking photos as the grounds are well-landscaped and dotted with statues, bridges and fountains such as the replica of the Le Bassin d’Apollon at the palace of Versailles. Inside the museum are mainly European classical and impressionist works, plus exhibitions on Natural History, historic weapons, and musical instruments – particularly violins. There’s also a permanent Rodin exhibition. It’s an impressive collection for a private museum and occasional collaborations with the National Palace Museum or curators from Japan lend it a more Eastern flavour upon occasion. Sicao – or Four Grass – green tunnel is an ecological boat ride in a protected wetlands area. The ride takes you through a ‘tunnel’ of low hanging mangroves that arch over the waterway. Although the channel is man-made (in the Japanese period for trade purposes) it is a pretty excursion that allows you to get close-up to nature as there are plenty of chances to spot wildlife and the local fauna along the way. There is also a separate boat ride along the river proper which focuses more on the area’s history as a trading hub and bird spotting. The boat rides embark from near a large temple which is also worth a visit while you are in the vicinity. 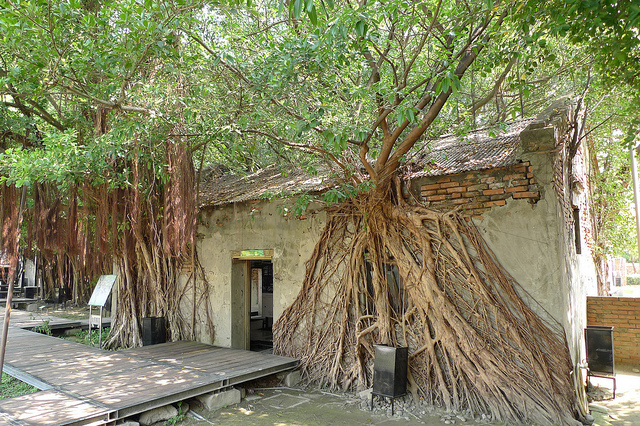 This charming site is simply ruins of former Japanese warehouses which have been overrun with Banyan trees and partially restored with elevated walkways and the like threading through local art exhibitions. It’s a nice way to spend an hour or so and get some memorable shots around the place. It’s about a ten minute walk from the Zeelandia Fort. Don’t forget to try the ice-cream! Tainan is renowned for its street food and the area around the fort is crammed full of stalls selling local small dishes. Some larger places offer several dishes at once, but the more traditional way to partake is to try each food at the stand that specialises in it. Don’t miss the oyster omelette, a glorious concoction of fresh local oysters folded into a starchy egg based pancake with leafy local veg and a sweetish sauce. Although you can get this dish in every nightmarket in Taiwan this is where it originated. Other snacks to look out for are the Tainan shrimp rolls, sailfish ball soup (a simple broth with three small fishballs in so you’ll have room for other snacks!). There are also plenty of stalls selling locally-made handicrafts some of which might make nice presents to take home. Other notable spots in Tainan include the period Japanese Hayashi department store, built in 1923 which retains the original fixtures and fittings, several large nightmarkets and innumerable temples some of which are the oldest or largest of their kind in Taiwan.